Five postcards, one photograph of a painting and two magazine cuttings of images of Caribbean sugar mills. Documents relating to Niall's visit to the Caribbean in 1996, visiting Antigua, St Kitts, Guadelope, St Martin, and Martinique. Contains correspondence (some in French), notes, photographs of St Kitts, and ephemera. Series of colour slides depicting sugar mills in Martinique, Antigua, and Marie-Galante, Guadelope. "Betty's Hope. 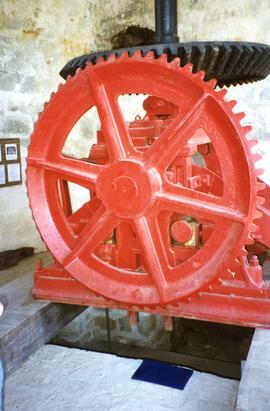 Antigua's only remaining twin sugar mills at Betty's Hope Estate dating from the 17th Century.". "Disused sugar mill, Side Hill, Antigua, West Indies. Drawing by Gilly Gobinet". [From a drawing by William Clark in 1823. 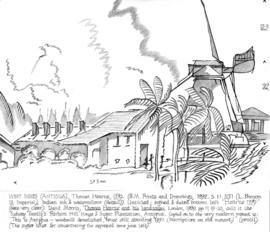 Depicts a mill yard on Gamble's Estate, Antigua]. "25 - Betty's Hope: Sails and boarded landing edge Antigua"
"24 - Betty's Hope Mv: Cross Antigua"
"23 - Betty's Hope Mv Stocks Antigua"